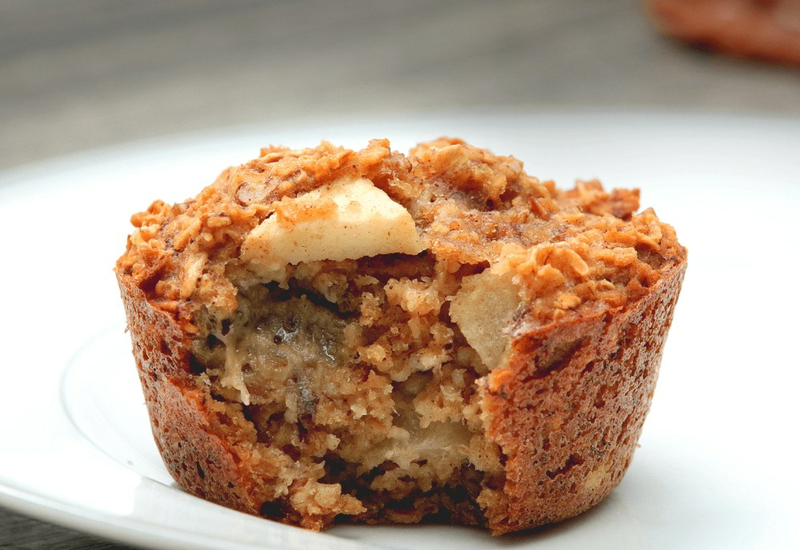 Start your morning out right with these Hearty Oatmeal and Apple Muffins. Everything here is a smart swap for healthier choices. Ground oatmeal replaces flour, banana stands in for oil, and honey is the only sweetener here. They may be stout, but these hearty, sweet muffins stand above the rest: moist and delicious. Whip up a batch over the weekend and enjoy one for breakfast all week long! They are perfect to grab just as you’re running out the door. Following a vegan diet? Increase baking powder by 1/2 teaspoon, and substitute flaxseed meal and water for the eggs: mix 6 tablespoons water and 2 tablespoons flaxseed meal. Let the flaxseed meal absorb some of the water, then add it to the other wet ingredients. Per Serving: 102 calories; 3g fat; 17.5g carbohydrates; 2g protein; 22mg cholesterol; 166mg sodium. These are some tasty muffins!!! I love the bite that the whole oatmeal gives and the crunchy pecans can't be beat. I added some extra cinnamon, because I'm spicy like that, and 2tsp worked perfectly! These lovelies are filling and super easy to put together. If you bake in a silicon pan, allow the muffins to cool in the pan for at least 10 minutes. My batch made 14 large muffins. These are incredibly yummy and filling. I added a bit more cinnamon and took out the pecans and added sliced almonds instead. They turned out really great. I absolutely love the combination of sweet ripe bananas and crisp apples in season. I've combined the two fruit in crisps, but am so happy with this wholesome snack that I can easily pack for my kid to take to school. YUM. I added extra cinnamon and chopped apple, along with some nutmeg and a little freshly grated ginger. Yum! These apple muffins are a favorite in my house. I make a large batch and my hubby and I eat them in the morning with our coffee. This recipe also works great in a loaf pan. LOVE these muffins! Super easy to make and they taste delicious. Perfect for breakfast and also dessert.